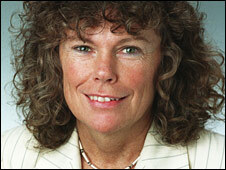 Labour MP Kate Hoey will work as an adviser for Boris Johnson if the Tory candidate becomes London's mayor. Ms Hoey said even though she will be Mr Johnson's adviser on sport and the 2012 London Olympics, she is not endorsing him for mayor and will vote Labour. Labour mayor Ken Livingstone said Ms Hoey had been "a sort of semi-detached member of the party in recent years". Liberal Democrat candidate Brian Paddick said: "Kate Hoey is bonkers - they make a perfect couple." Mr Johnson had said the MP for the south London constituency of Vauxhall will be part of his administration. But the former sports minister denied this saying: "The key part of the Boris Johnson statement - ie that I will be the first member of his administration - is wrong. "I have simply agreed ... that I will advise on a non-partisan basis in respect of my lifetime commitment to bringing sport to the people of London. "I am a Labour MP and I am standing for Labour at the next election. I support the Labour Government." Mr Johnson had said: "I am delighted to announce that Kate Hoey will join me in my administration if I win on 1 May. "She and I agree that there is much more that can be done to promote sport and to develop sporting facilities across London. "I am determined to bring talent from across politics and the community to a new administration." Mr Livingstone described Ms Hoey as "eccentric". He told BBC London: "Why would anyone in their right mind appoint as sports adviser the person who presided over the fiasco that was Wembley Stadium?" Londoners go to the polls on Thursday.